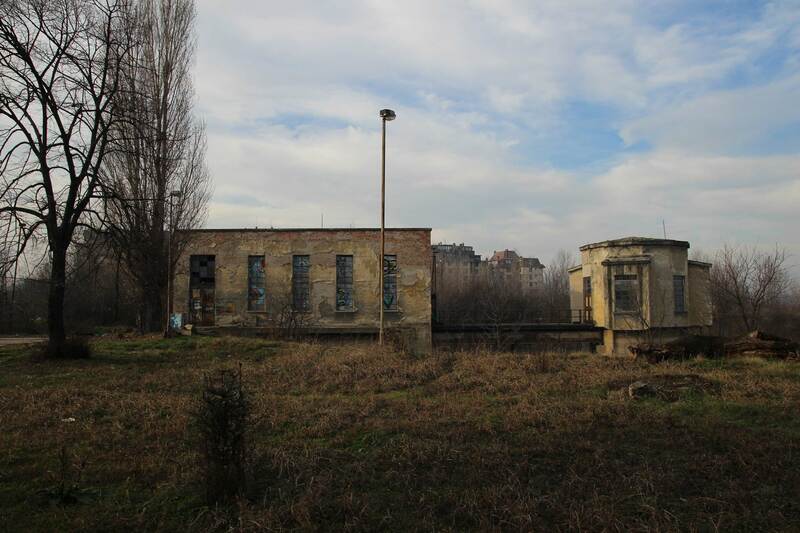 Abandoned since 1970 and used for underground techno parties in the 1990s and early 2000s, this impressive ruin of Belgrade’s second power plant is now too dangerous and is surrounded by a protective fence to prevent accidents. Belgrade’s second power plant, pompously named “Power and Light”, was a modern facility producing electricity for the growing city from the coal brought here by river. Its purpose, its sleek modernist lines and its location all made it one of the symbols of fast progressing interwar Belgrade. “Power and Light” was abandoned in 1970–the year that marks the beginning of its gradual decay–following the construction of the hydroelectric power plant Djerdap on the Danube. The man-made bay in front of it, used for the approach of ships carrying coal, was soon transformed into a marina for local boats. To this day this remains its only used part and the “Dorćol Marina” has become an important part of the identity of this quarter of Belgrade. Most of the marina’s users are locals with modest boats, all joined in one association of citizens. Forgotten by the city fathers, during the 1990s and early 2000s the power plant was still used for techno music parties and similar but has since become too dangerous even for that. The metal parts that could be cut off have been stolen and now there are only concrete walls and massive metal constructions still standing. Though there were numerous pleas to do something about it the city fathers still don’t have a definite plan for it, the latest one being that it will become the new seat of the Nikola Tesla museum. Abandoned since the year 1970 and stripped of almost everything inside of its walls, the old power plant now stands as an impressive (and dangerous) ruin on the Danube. Protective fencing around it nowadays serves mostly to prevent accidents from happening. VD: That electric heating plant hasn’t worked since the 60s. So over time it deteriorated, it deteriorated right up until it reached its current state, which is catastrophic, dangerous so to speak. What do you think are the main causes of its decline? Do you think it was deliberate or…? IČ: It was closed in ‘69. Because a second heating plant burning mazut was opened, I think. And after that it wasn’t subject to any detailed plans. The first detailed plan, an urban development plan for that location was adopted in 2005 by the city administration and the decision was made to build a residential block there with some office space and a new luxury marina. Now, what’s interesting there is that in that period, between the early 70s and the 2000s… In fact I discovered watching that documentary programme about the Black Wave and the New Wave that Kosta Bunuševac organised parties in that building and quite frequently too. So, I don’t know, Oliver Mandić performed and the whole gang around EKV and the new scene at SKC – they had parties in the “basilica”, which is actually most impressive when you go inside. And the next thing was the filming of “Šejtanov ratnik” and that’s where it ended. VD: And there was more between, in the 90s there were some raves… But back then it was more or less safe. VD: But do you see any… Let’s say, in the beginning it was deserted but later you were involved in the whole thing, especially at that time in 2005-2006 you could sense that it was probably deliberately allowed to fall apart so that the site could be used for something else, as is the case with the whole Danube quayside. IČ: Correct. What is also, let’s say, what also hints in that direction is the fact that part of the building is listed as cultural heritage, which should mean that any future investor would have to abide by those rules, which investors don’t usually like as a condition. And until 2009 the law didn’t allow us to own land, only real estate. And then those changes opened up new possibilities for investment, however, that Israeli company that was awarded the concession vanished without a trace in 2015. So they don’t exist anymore but they owe the Republic of Serbia 13 billion dinars and the Public Agency for Land Development is chasing them for, however now they are chasing a phantom company and that land with all the buildings on it is allowed to deteriorate. And this isn’t the first case like this, this sort of thing happens all the time in Belgrade but then through various privatisation processes that gets transformed into luxury apartments with content that doesn’t meet the needs of ordinary people. So this harbour is located in a very attractive area. By attractive I mean that the local community from Donji Dorćol and around the river uses that space very frequently. People have a need to go on walks, to be in open spaces and so on but the area was fenced off in 2005, so 12 years ago, with no access to the site. 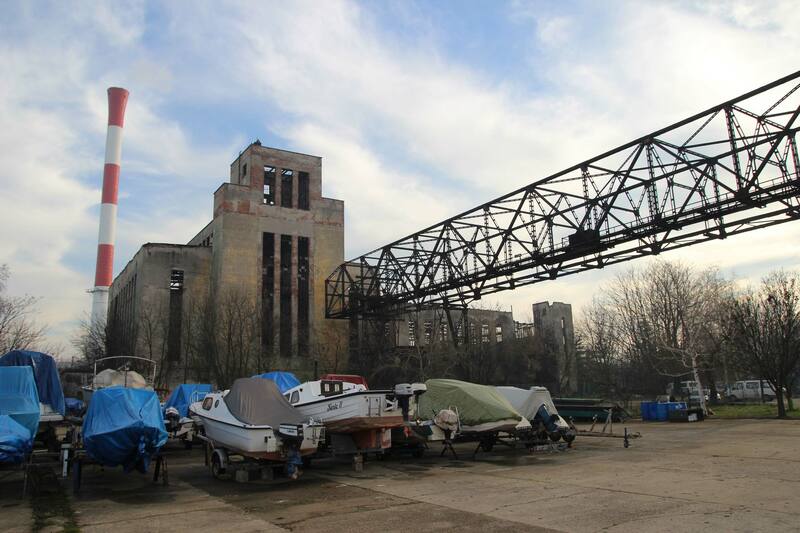 At the same time the Belgrade Harbour Company, which is also being privatised, where investors demanded a complete rezoning of the site. This resulted, of course, in them calling up one of the most famous architects, Daniel Libeskind and Jan Gehl who works on landscape design, to propose a design for a riverfront city, something like the Belgrade Waterfront project in shape but on a smaller scale and more oriented towards people in the sense of open spaces and recreational spaces for leisure. Of course, that investment also fell through and it was probably linked to the political parties in government at the time. VD: And what was Power and Light supposed to be in that whole concept? Do you remember? IČ: Power and Light still is a luxury marina with a residential component of around 74,000 square metres. VD: What do you think about how the plant looks today – i.e. how bad it looks – compared with the 1960s when it was operational? MP: Well, let me tell you, until recently, until I don’t know exactly when, but about 15 years ago, PIM was there, a company that worked on some kind of river works, I don’t know, they made harbours in Russia and who knows what else. So in addition to them we also had the marina. And then people were working and pouring all that concrete – it was pretty chaotic. Now things are much better compared with that time, it’s much tidier but it’s far from looking like a real marina. VD: Tell me, when Power and Light stopped working, was there anything here in the meantime? Has anything been done here or was it just left to deteriorate? MP: It was simply left to deteriorate and that’s unbelievable. Like this it looks like it was bombed. Instead it actually just fell apart from neglect. VD: And when it becomes the Nikola Tesla Museum, what effect do you think that will have on the marina and the surrounding area? MP: Maybe it won’t even have a good effect. Because more people will be coming to the area and we boaters don’t really like big crowds of people and it isn’t really good for there to be crowds of people, that’s when thefts happen and all kinds so… Oh well. VD: Last question: Do you know that now, in the Old Plant, is there anyone in there? Do homeless people live in there or is it deserted? Is there anyone to vandalise things…? MP: What I do know, my friend’s son made a film in the corridors of the Old Plant and what it looks like inside is horrible. Probably there are some security guards around the building but I don’t think there are any inside. VD: How do you look today, ie. The unseparated switchboard seems to be compared to that of some previous time until the 1960s when it worked? MP: Well, to tell you, it's up to the time, but until then I do not know exactly, but for 15 years, it was PIM, a company that dealt with some of the river works, I do not know, the port of rules in Russia and what I know. So we held a marina next to them. And then people worked and poured that concrete, it was quite chaotic. Now, it is much better, much more beautifully arranged, although it's far from a real marine look. VD: And tell me, and "Power and Light" after it stopped working, was there anything in the meantime in the meantime, has anything ever happened or is it simply left to collapse? MP: Just let it go down and it's incredible, it looks like it's like the bombing suffered. But it certainly fell out of disrepair and from the chasm. VD: And how do you think when the Nikola Tesla Museum becomes, it will be reflected on both the marina and the whole region? MP: Maybe it will not even be very good. Because there will be more people coming here and we, the ladies, do not like too much crowd and it's not very good to be crowded, then there are monkeys and three miracles, so ... Alright. VD: And the last question: do you know at all that now, in this Old Center, is there someone, some homeless people to live, or there is nobody, or someone has something to break ...? MP: What I know, from my buddy, my son shot a movie in the corridors of the Old Town, and it looks terrible how much I saw in there. Probably there is some around the building of some guards but in the building itself, I think there is not. VD: The second Belgrade “electricity factory”, very ostentatiously called Power and Light, that was built on the banks of the Danube was then built as a monumental building. Today, when locals and those not from Belgrade see what it looked like at the beginning it evokes a kind of wonder. Today it is for all intents and purposes another of Belgrade’s scars, something we cannot be proud of. How did that come to be, how did it manage to fall apart so much? RK: I would rather say, “how did so much of it manage to be saved?” You can also look at it from that angle. 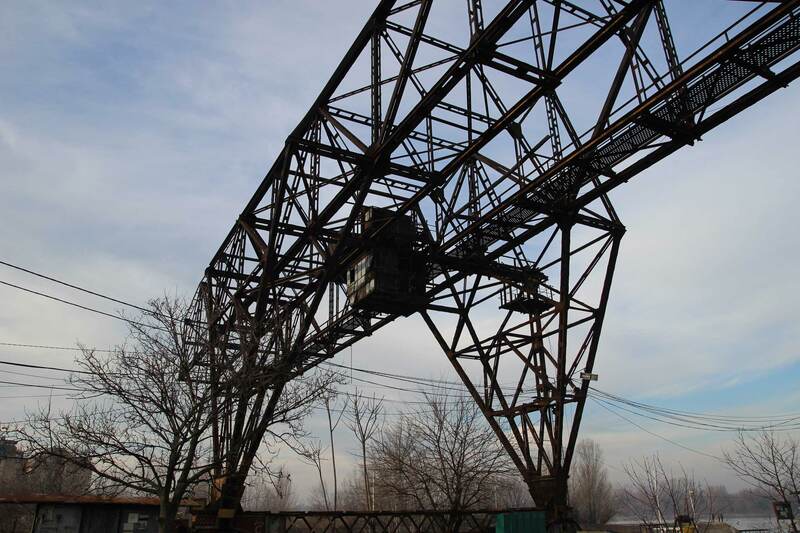 Belgrade, in that process of electrification that was so important for industrialisation at the end of the 19th century when, among other things, Đorđe Stanojević was largely responsible for introducing electrical energy first for industry and then, of course, for household use. Small hydro-electric plants were built around Serbia and they were connected mostly to factory lines. We have are lucky in Serbia because some of those old plants have been preserves – they were made at the start of the 20th century and have been preserved to this day – and more importantly still, they are still in use. They are completely perfect representatives of industrial production and, in my opinion, are gems on a wider scale, perhaps even in European proportions. As far as thermal power stations are concerned, they are larger electricity producers than those small hydro-electric plants and they haven’t been preserved in their original, operational scope instead… not all, some were re-used as offices or the Museum of Science and Technology where we are now. But not a single one was completely preserved. Looked at historically, the first was built in 1893 and it was located right here at this site. It was built by the Belgians for traffic in Belgrade. However, after the First World War as big investments came to Belgrade, the Belgrade municipal authorities decided to build a more serious, larger power station and that first building, in which we are now, and that power station was operational for a decade or so until it was decided in 1932 to grant a licence for it to be built. The Swiss got the contract to make a large, modern power station at what was thought to be the best location, on the banks of the river, which was always important for industry. Close to the railway, close to the river, to make transport of raw materials and products easier. So on the banks of the Danube, as we say by the Dorćol Marina (actually the Dorćol Marina was a chasm made for the power plant), over a period of two years Power and Light was built. A power plant that worked right up until the Đerdap hydro-electric plant was built and then it became one of the plants that was closed down. Some of the machinery was transferred to other plants and some of it was scrapped. So from 69/70 the plant was no longer operational and was left to the ravages of time. Actually, all that remained was the hollowed out building that is still there today. For me it’s interesting – not for me – it is interesting because the architecture completely has a useful value. From what I’ve been able to discover, it has an enormous amount of concrete that was poured into the foundations because of the vibrations, maybe from the railway, I don’t really know. As far as I do know, there were some attempts, in the 80s I think, or thereabouts, to blow it up or demolish it. However, they worked out that that amount of explosives would be a problem for the surrounding area and nothing came of it. So, it has no useful value. Whether it will one day be a conservation centre, as was muted at one point, whether it will be a Museum of Electricity or whether it will be part of some residential/commercial complex, I don’t know. But what is for certain is that its static value should be assessed. Then the buildings should be valued, and not only the buildings – there are two – then it should be decided what to do with the crane that’s been stood there, unused, for decades. That’s one thing. On the other hand, there should be an evaluation of the symbolic value of the building itself because of its prized location on the southern bank of the Danube on which you have, when you go by boat, when you look at Belgrade from Zemun, from those sandy plains and those sandy areas, we have Zemun, then the Great War Island, then we have the power plant and then there’s practically nothing for kilometres. And it’s located on Corridor 7, if I’m not mistaken, on the Danube, which passes through Serbia for close to 600 kilometres.